During a moving and far-reaching speech on Saturday, President Barack Obama pushed Congress to fight for the restoration of a key provision of the Voting Rights Act, condemned the long shadow of racism that still haunts the nation, and celebrated economic and social gains for people of color in America since the pivotal civil rights marches took place in Selma, Ala., 50 years ago. The nation’s first black president and his family were in Selma to commemorate "Bloody Sunday" on the 50th anniversary of the day police attacked marchers demonstrating for voting rights. The president and first lady Michelle Obama were joined on the dais by former President George W. Bush and former first lady Laura Bush before a crowd of about 40,000—almost double the city's population. Obama was introduced in the afternoon by civil rights icon U.S. Rep. John Lewis (D-Ga.), who was viciously beaten by police on March 7, 1965, on the Edmund Pettus Bridge during the demonstration that has become synonymous with the civil rights movement. He also tackled the nation’s persistent and pervasive problems with racism, citing a damning U.S. Department of Justice report that found a pattern of racial bias in the Ferguson, Mo., Police Department. The report, released this week, came after ongoing protests over the shooting death of unarmed black teen Michael Brown by a white Ferguson police officer after a brief confrontation in August. 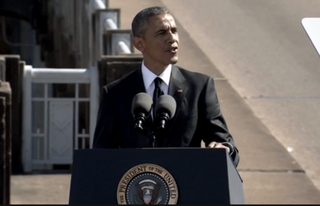 He added that Selma’s march is not over. “We know the march is not yet over, the race is not yet won, and that reaching that blessed destination where we are judged by the content of our character requires admitting as much,” he said. He also touched on criminal-justice reforms, including addressing unfair sentencing, which has bipartisan support among congressional lawmakers. “Together we can address unfair sentencing, and overcrowded prisons and the stunted circumstances that rob too many boys of the chance to become men, and rob the nation of too many men who could be good dads and workers and neighbors,” he said. And with that, the president and about 50 others marched across the iconic bridge as the sun began to set.